Managing cultural differences is a mandatory class for Bachelor in International Management (BIM) students majoring in International Business and an optional class for all other students. In today’s international business world, it is crucial to have knowledge and awareness of various cultural differences across the globe. Important topics include business etiquette, behavior and taboos found worldwide. For example, did you know that in South Korea, it is impolite to stick your chopsticks vertically in a bowl of rice or that in Sweden, if you arrive more than 15 minutes late, your meeting will be cancelled? Both major and minor differences between cultures are discussed to prepare students for an international career. The class is taught throughout the fall semester. 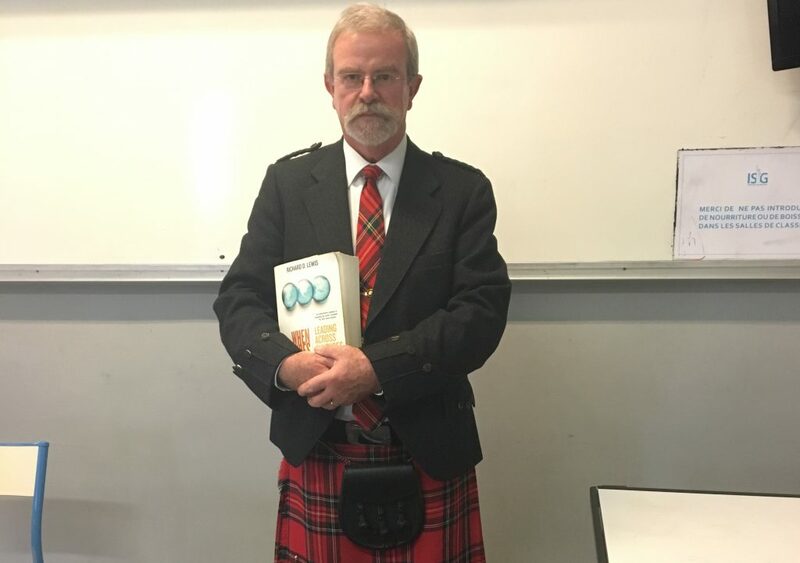 In addition to the final exam, the students have to present the culture and business etiquette from a country of their choice and they are also encouraged by their professor (see picture below) to dress up in traditional outfits. In the picture, the professor is wearing traditional Irish clothing for last lecture of the semester.